Come by Island Mazda near Jackson Heights, NJ to experience the powerful 2018 Mazda CX-3. 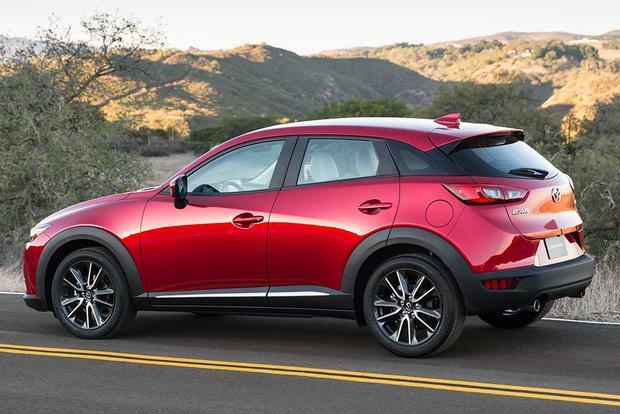 The CX-3 is a study in striking, well-balanced design proportions. From its rich contours to its athletic silhouette. Making everything about the CX-3’s overall form appear agile yet firmly planted to the ground. It’s the essence of KODO design: simple lines that express energy and movement. Even at a standstill. The interior of the CX-3 expresses the vehicle’s unique character. Colors and fabrics are combined in unexpected ways to inspire a sense of sporty refinement. On select models, carefully crafted lines of stitching create a feeling that’s solid and rich. Everywhere you look, clean lines and modern design help eliminate distraction, so you can focus on what matters most—driving. At your feet, even the CX-3’s1 most basic features, like foot pedals, are engineered to make driving effortless and enjoyable. Symmetrically placed to align with the driver’s centerline, each pedal is specifically designed for easier and more precise control and stability—all to help eliminate foot fatigue on longer drives. On select models, carefully crafted lines of stitching create a feeling that’s solid and rich. Everywhere you look, clean lines and modern design help eliminate distraction, so you can focus on what matters most—driving. Weather and road conditions can change in an instant. That’s why Mazda’s available smart predictive i-ACTIV AWD all-wheel-drive system is always on alert, monitoring conditions and ready to adjust power delivery to help give you optimal traction before your wheels can slip. By constantly monitoring everything from outside temperature to throttle input and braking patterns, available i-ACTIV AWD predicts when all-wheel drive might be needed. Then it preemptively optimizes torque distribution to help curb traction loss. Even when the weather’s perfect, available i-ACTIV AWD helps stabilize and improve the CX-3’s overall road grip. While driving down a winding hill or simply making a sharp turn, the technology senses changes in steering effort caused by a puddle or some loose gravel and distributes torque more evenly. Every aspect of the Mazda CX-3, from its body construction and engine technology to its chassis and transmission, is engineered to maximize driving dynamics. And minimize fuel consumption. This is made possible by SKYACTIV TECHNOLOGY, our unique engineering approach that gives you a better driving experience with up to an equally impressive EPA-estimated 34 highway MPG. Stop by Island Mazda near Jackson Heights, NJ to test drive the innovative 2018 Mazda CX-3. You can also browse our online inventory of 2018 Mazda CX-3’s here. We look forward to doing business with you!